In August 2014, the Islamic State of Iraq and Syria (ISIS) stunned the world by capturing Iraq’s second largest city, Mosul, sending shockwaves across the world. About 800 ISIS fighters routed an estimated 30,000 Iraqi Security Forces, who threw away their weapons and uniforms, and fled for safety. In a matter of weeks ISIS fighters had captured several other Sunni dominated provinces in­cluding Nineveh, Salahuddin, and parts of Diyala, reaching the outskirts of Iraqi capital, Baghdad. Even more shocking was the massacre of 1,700 Iraqi soldiers and the displacement of roughly half a million people who escaped the atroci­ties of the terrorist group in the wake of its sweeping advances. Shortly after taking Mosul, the group formally changed its name to the Islamic State, inviting all Muslims to immigrate to the newly founded Caliphate. The atrocities com­mitted by the IS caused one of the most serious refugee and humanitarian cri­ses since the end of World War II and the group is considered as one of the most serious threats to international security. This paper addresses two parallel issues: How—and to what extent—did both the US intervention in 2003 and sectarian conflict contribute to the rise and consolidation of Islamic State? Using a case study methodology, the re­search focuses on abovementioned factors for the following three reasons. First, there is an academic and research gap regarding these two factors in Iraq’s case. Many papers have been written on IS which discuss different as­pects of the group and many politicians have blamed the US intervention and sectarian policies of Prime Minister Nouri al-Maliki of Iraq for the rise of the group. However, there is little systematic analysis in academic literature re­garding these two factors and their contributing mechanism. Second, these two factors are considered the most important contributors to the rise and consoli­dation of IS. And third, research and analysis on these two factors could have significant policy implications not only in dealing with IS but also for future ex­ternal interventions in the region. The US intervention in Iraq and its aftermath contributed to the rise and strengthening of an insurgency that eventually evolved into IS. It could be ar­gued that, in many ways, the fall of Saddam Hussain and his Ba’athist regime was inevitable and just a matter of time. He was one of the longest ruling dicta­tors of modern times, who invaded two neighboring states, destroyed and im­poverished his country in unnecessary confrontations with his neighbors and the West, and was not shy to use chemical weapons against his own people. He came from the Sunni community of Iraq, who make up about 20 percent of the Iraqi population, and persecuted the country’s Shias and Kurds who constitute about 60-65 and 15-20 percent of Iraqi population respectively. He might have been overthrown by the Arab Spring as was the case with Mubarak, Qaddafi and Ben Ali or may have faced an insurgency like Bashar al-Assad in neighbor­ing Syria. It will never be known, as is the case with all counterfactual incidents. However, it may be said with confidence that with him in power the world would not have witnessed a large scale Sunni insurgency which eventu­ally evolved into Islamic State. While al-Qaeda was a by-product of the Soviet invasion of Afghanistan, the rise of IS was facilitated by the US intervention in Iraq in 2003. The Soviet inva­sion, which lasted for a decade from 1979 to 1989, led to an Islamists-led insur­gency, attracting thousands of Afghan and foreign fighters. The US and its Western allies supported the Afghan Mujahedeen against the Soviets by providing them money, arms and training through the Pakistani Inter-Services Intelligence (ISI). During this period, many Arab fighters, among them Osama Bin Laden, came to Afghanistan to take part in Jihad against the Soviet Union. When the Soviets withdrew from Afghanistan, many of these fighters returned to their countries to form or join radical groups to fight their governments. Us­ing contacts and reputation built in Afghanistan, Osama Bin Laden founded Al-Qaeda in 1991 to wage a global war against the West. Abu al-Zarqawi was one of the radicals who met with Bin Laden and his lieutenants in Afghanistan and ran a training camp in the western Afghani­stan province of Herat. He returned to Iraq to found the radical movement, ’at Jihad (the Group of Unity and Jihad) in 1999. This was the movement which continued to evolve into Al-Qaeda in Iraq (AQI), Islamic State in Iraq, Islamic State in Iraq and Syria (ISIS) and finally the Islamic State (IS). According to French counterinsurgency scholar, David Galula, the first prereq­uisite of a successful insurgency is the existence of a strategic cause that can at­tract a significant number of people. This is because the insurgent leaders have to find potential supporters among the population and convince them to actively or passively support the insurgency. For instance, the Soviet invasion of Afghanistan was an attractive strategic cause not only for the insurgents from within the country but also from around the Muslim world, from where many fighters joined the insurgency. In the same way, the US intervention in Iraq provided the insurgents with a strategic cause to attract fighters and funding. Insurgents’ resources, power and capabilities were in no way comparable to those of the US, but they had a valuable intangible asset – the cause to fight foreign invasion – which helped them attract a significant number of support­ers, fight and continue to evolve. Although Jama’at Tawhid Wal Jihad group (the Group of Unity and Jihad) was founded in 1999, it was the 2003 US intervention in Iraq which provided the group and its leader Zarqawi the opportunity to lead a large scale insurgency with a strategic cause of fighting external invasion. The first time Zarqawi came to headlines was following the attacks on the Jordanian Embassy and the United Nation compound in Baghdad in August 2003. The group was initially founded to fight against the existing secular governments, but the cause was not attractive enough to mobilize a significant number of people. As the insurgency gained momentum after the US 2003 intervention, so did Zarqawi’s group’s activities. Between 2003 and 2005 the group was responsible for 42 percent of all suicide bombings which made up the bulk of casualties. The First Battle of Falluja, where the insurgents showed stiff resistance and bled the world’s strongest army, led to an increased public appeal and strength of Tawhid Wal-Jihad group in Iraq. In October 2004, al-Zarqawi pledged his al­legiance to Osama Bin Laden, the leader of Al-Qaeda, and changed the name of the group to Tanzim Qaedat al-Jihad fi Bilad al-Rafidayn, or al-Qaeda in the Land of the Two Rivers, referred to as al-Qaeda in Iraq (AQI). The Second Battle of Falluja that began in early November 2004 and lasted for six weeks further added to the notoriety of al-Zarqawi and AQI. The battle was tactically won by the US military who took the city with more than 2000 casualties to the insur­gents compared with only 70 US marines’ casualties. However, the destruction of the city and the displacement of civilians provided a valuable propaganda tool for the rebels. Al-Zarqawi was killed in an American air strike on 7 June 2016, but AQI con­tinued to fight and evolve. In October 2006, the AQI was joined by some other insurgent groups to form the Islamic State in Iraq (ISI). As the external interven­tion and sectarian conflict continued to fuel the insurgency, deceased leaders were replaced by others and the group continued to evolve. The table below shows evolution of the Islamic State overtime. Table 1. The evolution of ISIS. Another prerequisite for a successful insurgency, according to Galula, is the weakness of counterinsurgent or government forces. The weakness could be political such as weak legitimacy, administrative such as the inability to provide good governance and jobs, or military weakness such as insufficient resources and troops. Despite the US intervention providing a strategic cause for the in­surgency, the rise of IS was not inevitable and a well-planned and resourced COIN campaign could have defeated the rebels. However there were political, military and administrative weaknesses of the US COIN campaign which al­lowed the insurgency to rise and consolidate. The US President G.W. Bush announced that “our mission is clear, to disarm Iraq of weapons of mass destruction, to end Saddam Hussein’s support for ter­rorism, and to free the Iraqi people.”  However, the US military failed to un­cover any weapons of a mass destruction program, and even the US govern­ment was accused of manipulating intelligence to support the invasion despite knowing that such a program did not exist. On the other hand, not only did the intervention not reduce terrorism, it also changed the terrorists from thugs and extremists to freedom fighters in many people’s eyes. The lack of coordination between the US Department of Defense (DOD) and Department of State (DOS) in the post intervention period further added to the problem leading to a window of opportunity being lost to win over credibility and support of the population. Instead of winning the hearts and minds and support of the population, some decisions of the Coalition Provisional Authority (CPA) in the initial phase of in­tervention were counterproductive and instead strengthened the insurgency. Two of the most ill-fated and problematic policy decisions which injected life and blood to the insurgency and whose effects continue to the present was the de-Ba’athification of Iraqi society and the dissolution of Iraqi security forces. The very first Order issued by Paul Bremer, head of the CPA, was about de-Ba’athification of Iraqi society. According to that order, members of Ba’ath Party were dismissed from their positions and banned from future employment in government. In addition, individuals holding positions at ministries or other government institutions, including universities and hospitals were to be inter­viewed and removed from their jobs if found to be linked to Ba’ath Party. This practically targeted the Iraqi Sunni community who made up the bulk of the Ba’ath party membership and senior government positions, leaving them no option but to fight back. The second CPA order issued on 23 May, 2003, dissolved the Iraqi army and other security institutions and cancelled “any military or other rank, title, or status granted to a former employee or functionary of a Dissolved Entity by the former regime.”  This left some 230,000 former Iraqi military officers and Non-Commissioned Officers (NCO’s) on the streets, explicitly ruling out any hope for a future employment or career. Well-trained and armed, many of them joined the insurgency led by al-Zarqawi or other insurgent groups. Since then, Ba’athists and former army officers have formed the backbone of the insur­gency throughout the years. In 2006, 99 out of 200 generals of the old Iraqi Army “were probably active in the insurgency.”  When Abu Bakr al-Baghdadi took over the leadership of the group, he started an aggressive campaign in 2010 to recruit former Ba’athists and army officers to revitalize the weakened insurgency. For instance, 34 out of 42 senior AQI leaders were killed in a very short time, and al-Baghdadi used this opportunity to fill those vacancies by former Ba’athists and military officers, in what was seen as “Iraqization” of IS. Many US military and civilian leaders realized the negative impacts of de-Ba’athification and dissolution of Iraqi security institutions over time, but they could not reverse or stop the process. A de-Ba’athificationcommission contin­ued to function and played a role in disqualification of many important Sunni leaders in the 2010 parliamentary elections. Prime Minister Maliki arrested a large number of alleged Ba’athists even as late as 2011. Some Ba’athist and former army officers had joined the Awakening Movement and fought Al-Qaeda during the “surge” in 2007. However, once the US troops left, the Iraqi government abandoned the Awakening Movement and started harassing its leaders who were once again left with no option but to join IS. The US intervention in Iraq not only suffered from political legitimacy and mis­calculations but also from insufficient resources and poor counterinsurgency efforts in the early stages. While known to be the best conventional military with unprecedented advanced technology and firepower, the US army was not ready for countering an insurgency. It “went into Iraq in March 2003 without any of the doctrine, training, or other preparations.”  Lessons learned in Vi­etnam had not been internalized and were discarded. And the Bush administra­tion was not ready to commit the required number of troops to maintain secu­rity and order in post-Saddam Iraq. Insufficient resources meant that the US forces were not able to protect the population and gain their support, the key to success according to counterin­surgency theories. It also meant that the US military commanders were not willing to confront the Shia militias and trouble makers, especially Muqtada al-Sadr and his Mahdi Army, which contributed to sectarian problems and loss of credibility for both the US and Iraqi governments. Moreover, insufficient troops and resources rendered the US troops and Iraqi government unable to provide rule of law and basic services – means that could have earned them legitimacy and support of the populace. In short, weakness of the counterinsurgents, in this case the US and Iraqi governments, including weak legitimacy, problematic policy decisions, lack of a COIN doctrine and insufficient resources and troops led to a deterioration of security and an exponential increase of violence in Iraq. The number of attacks by insurgents increased to 26,496 in 2004 and to 34,131 in 2005. In late 2005, the number of improvised explosive devices (IED) attacks reached to about 1,800 per month. Al-Zarqawi was targeting the Shias indiscriminately to pro­voke sectarian conflict while the Shia-dominated security forces were responsi­ble for incidents of torture and extra-judicial killings of the Sunnis and sus­pected insurgents. With the bombing of the Samarra Shrine, which is the most sacred shrine among the Shias, in February 2006, the insurgency turned to a large scale sectarian violent conflict. The Shia death squads entered in the Sunni areas, indiscriminately killing civilians while the Sunni extremists contin­ued to target Shia civilians by suicide bombings, increasing the civilian casual­ties to 34,000. As the insurgency and violence continued to intensify, the US military contin­ued to learn and adapt. When General Petraeus was appointed as the top American command in Iraq, he helped publish the US Army and Marine Corps Counterinsurgency Field Manual (FM 3-24). In January 2007, the US President, G.W. Bush, ordered the deployment of more than 20,000 additional troops to Iraq which was termed as the “Surge,” while at the same time commanders of on the ground changed their counterinsurgency strategy. According to Australian COIN expert, David Kilcullen, “the surge is not the strategy – the switch to population security and a residential, high-force-den­sity, long-term approach is what matters here.”  The same can be concluded from President Bush’s State of the Union address in January 2007, when he outlined the purpose of the surge as: “Our troops will have a well-defined mis­sion: to help Iraqis clear and secure neighbourhoods, to help them protect the local population, and to help ensure that the Iraqi forces left behind are capa­ble of providing the security that Baghdad needs.”  Major General Joseph Fil, commander of Multi-National Division – Baghdad, who oversaw the implemen­tation of Baghdad Security Plan in February 2007, described the objectives of the plan as: “through this operation, the government of Iraq is seeking to show the Iraqi people and the international community that it is able to protect all its citizens, regardless of sect or ethnicity.”  At the same time, the US command­ers worked with Sunni tribes and the general population as part of the Sahwa or Awakening Movement, which succeeded in turning them against AQI until the US troops withdrew from Iraq. It could be argued that the change in strategy which was aimed at protect­ing and gaining the support of the population worked. From its highest point in late 2006, by November 2007, violence and insurgents’ attacks had dropped to their lowest levels since 2004. While there were 300 attacks in al-Anbar prov­ince per week prior to the “surge,” their number had dropped to about 20 per week in late 2007. There was a dramatic improvement in Baghdad security as well. The civilian deaths which reached 3,000 in December 2006 was lowered by 70 % by November 2007. The number of attacks was down by 60 %, and sec­tarian violence had plummeted by 90 %. A significant part of the reduction in violence could be attributed to efforts at fixing the political challenges, including the inclusiveness and legitimacy of the Iraqi government. The Sunni Awakening or SahwaMovement, a US sup­ported program to arm the Sunni tribes to defend themselves, was very effec­tive in turning them against Al-Qaeda and consequently reducing violence and weakening of the insurgency significantly. While the “surge” brought significant resources and the right population-cen­tric COIN strategy, which succeeded in reducing the violence and weakening the insurgency, support for the war in the US had plummeted to its lowest point since the start of intervention. From the political perspective, it was diffi­cult to commit to a long term presence of US troops in the country. At the same time, the Iraqi government had little interest to extend the presence of US troops in Iraq. A US-Iraq Status of Force Agreement (SOFA) was signed by President Bush and Iraqi Prime Minister Maliki in 2008, according to which all US troops withdrew from Iraq by the end of December 2011. 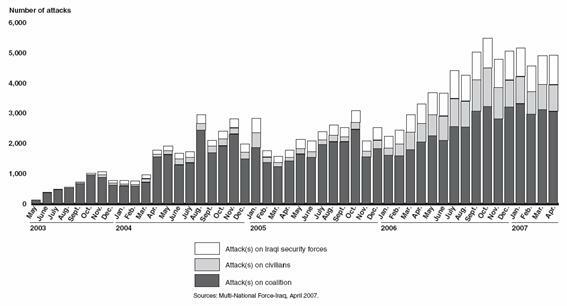 Although there have been disagreements, it could be argued that there were mainly two plausible contributing factors for improvement in security in Iraq in 2007. First, the “surge” and the application of a population centric coun­terinsurgency enabled the American and Iraqi troops to protect the population from the insurgents, who could no longer terrorize them into cooperation. The increase in violence and casualties of US and Iraqi forces in the initial stages of the “surge” shows that insurgents and Shia militias did not just decide to stop fighting – rather the new strategy severely restricted their abilities to continue to fight. Second, the combined effects of Sahwa Movement and the protection of the population removed the sectarian security dilemma faced by the Sunnis. As a result, the Sunni communities turned against AQI and other extremists, leading to a significant weakening of the insurgency. However, given that the Iraqi government could not maintain the support of the population due to its weaknesses and sectarian policies, the premature withdrawal of US troops al­lowed a revival of insurgency which eventually evolved into IS. According to COIN theories, the population is the center of gravity and its sup­port – the key to success for either side. In addition to political and military measures, the counterinsurgents aim to gain this support through delivering administrative services such as education, jobs, healthcare etc. In post-Saddam Iraq, however, the Iraqi government was not able to provide basic services to the population properly. De-Ba’athification had removed many skilled and ex­perienced individuals from different ministries, crippling the government func­tioning. On the other hand, De-Ba’athification and dissolution of Iraqi security institutions had also left hundreds of thousands Iraqis, including “tens of thou­sands” of schools teachers unemployed. All this presented significant adminis­trative challenges to the Iraqi government and curtailed its ability to provide services and gain support of the people. The “surge” and the consequent shift to a population-centric strategy meant more combat and kinetic operations, leading to the arrest of thousands of in­surgents who were detained in US run detention facilities. These detention fa­cilities were used by ISI as “Jihadi Universities” for recruiting, indoctrinating, networking and transferring skills among the fighters. One of the major deten­tion centers was Camp Bucca, which housed 26,000 insurgents in 2007, and funneled some 100,000 detainees including many of the top leaders of IS. Besides Abu Bakr al-Baghdadi who spent five years in Camp Bucca, nine other member of IS senior leadership, including al-Baghdadi’s deputy, Abu Muslim al-Turkmani, IS senior military leader Haji Bakr (who was killed), and the leader of foreign fighters Abu Qasim served time in the facility. Given that in­surgents could not get together for fear of being targeted by American troops, Camp Bucca was a great opportunity for them to stay together for months and in some cases years to develop their plans. Many of the people who served in this Camp had some links to insurgents, which was why they were there in the first place. However, even accidental guerrillas or former Ba’athists who had nothing in common with IS ideology were turned into hard­liners while serving there with many radical ideologues. According to Richard Barret, Camp Bucca facilitated and strengthened the alliance between members of AQI and ex-Ba’athists. Many Ba’athists whose time in prison overlapped with Abu-Bakr al-Baghdadi became senior leaders of IS. Over the years, inmates who were released went back to join the insur­gency with much better skills and wider network of contacts. After the prison was transferred to Iraqi authorities following the withdrawal of US troops, the remaining inmates were released, which had a significant negative conse­quence for the insurgency in Iraq and the evolution of IS. In short, the years in Camp Bucca were formative for IS. The radical Islamists who provided the ideology intermingled and cemented their alliance with Ba’athists who had the military planning, strategic and governance skills. This was something that eventually changed IS into a powerful and deadly organiza­tion, a pseudo-state which has out-governed many of the Syrian rebel groups and perhaps even the Syrian and Iraqi governments. To sum up, the US intervention in Iraq in 2003 contributed to the rise and consolidation of IS by serving as a strategic cause for the insurgency, while in­effective US and Iraqi government COIN strategy and insufficient resources al­lowed the insurgency to expand. Although the US troops’ “surge” and change of the US COIN strategy succeeded in weakening the insurgency, the lack of a long-term commitment and the premature withdrawal of US troops led to a re­vival of the insurgents. And finally, poor management of US-run detention fa­cilities played an important role in the rise and consolidation of the Islamic State by facilitating networking and indoctrination of insurgents in custody. Sectarian or ethnic conflict, which is referred to the conflict between Shias and Sunnis in Iraq and the region is another important factor that contributed to the rise and consolidation of IS. To analyze this hypothesis the paper will be relying on theories of ethnic conflict. Although technically ethnicity and reli­gious sects are different, for the purposes of this article the two terms will be used synonymously, and Shiism and Sunnism will be used as two separate identities similar to ethnicity. Traditionally, Sunnis have dominated political power in the Islamic world. Ever since the Islamic Revolution in Iran, Shias have continued to increase their power and influence in different countries, causing concerns among the Sunni regimes in the Middle East. The Iran-Syria alliance strengthened the position of the two countries against their Sunni dominated neighbors. The creation of Hezbollah and its emergence as a strong player in Lebanon and in resistance against Israel further boosted the confidence of Shias in the region and beyond. Finally, the fall of Saddam’s regime and its replacement by a Shia dominated government changed the balance of power in this traditionally Sunni domi­nated region, intensifying concerns and anxiety, which has been expressed by Sunni leaders. In late 2004, King Abdullah of Jordan expressed concern that if the Shias dominate the post-intervention Iraqi government, “a new crescent of dominant Shia movements or governments stretching from Iran into Iraq, Syria, and Leb­anon could emerge …”  In September 2005, Saudi Foreign Minister, Saud bin Faisal, criticized the war in Iraq as “handover of Iraq to Iran” and expressed concern about Iranian influence among the Iraqi Shias. In a similar trend, in April 2006, Hosni Mobarak, the then President of Egypt criticized Iraqi and other countries’ Shias for being more loyal to Iran than their own country. To counter the Iranian influence, the Saudis have attempted to proliferate their anti-Shia Wahhabi ideology by funding of mosques, madrasas and educa­tional institutions throughout the world. Between 1982 and 2005, Saudi Ara­bia financed 210 Islamic centers, 1500 mosques, 202 Islamic faculties and 2000 schools around the world. In 2013, the country provided 35 billion USD funding for schools in South Asia which is home to around one billion of the world 1.6 billion Muslims. While this may be partly because Saudis believe in Wahha­bism and therefore do so for religious purposes, one cannot disregard the fact that Shia-Sunni sectarian consideration also plays a part in this. The sectarian conflict in the region has benefited IS in two ways. First, it has led to generous funding for the insurgent groups, which has directly or indirectly benefited IS. Second, the sectarian support of the Sunni tribes for IS has strengthened the group against the Iraqi and Syrian governments. Moreover, sectarian motivated conflict in Syria led to weakening of the Assad regime, leaving a gap where IS could expand. Sunni regimes in the region have been concerned about a potential uprising and insurgency among their Shia populations since the late 1970s. One could argue that one of the main reasons for Suddam’s war against the nascent Is­lamic Republic of Iran was the fear of the export of the Shia revolution to Iraq. Given that Iraq is a Shia majority country, a security dilemma for Saddam may have been either to attack and destroy the Shia regime while it was weak or face a Shia revolution at home inspired or supported by the Islamic Republic of Iran. However, while Saddam did not succeed in overthrowing the Shia revolu­tionary regime, the balance of forces was such that Iran could not export its revolution to Iraq or to any other major Sunni dominated countries. Despite that, mutual suspicions between the Islamic Republic of Iran and Sunni coun­tries continued. Since the overthrow of Saddam which disturbed the sectarian balance of power, sectarian considerations in the region have helped funnel millions of dollars from the Sunni countries of the Gulf region to Islamic State. The Gulf countries and Turkey have directly or indirectly supported the Sunni insurgent groups in Syria, hoping to balance the replacement of Saddam’s regime by a Shia government, with the replacement of al-Assad regime with a Sunni ex­tremist group. In addition to direct government funding, these countries have turned a blind eye on funds flowing from wealthy individuals, charitable foundations and other networks to insurgent groups. In 2012-2013, bags of cash filled with mil­lions of dollars were channeled to insurgents groups through Turkey on regular basis. In 2013 and 2014, IS received as much as 40 million USD from the gulf countries. Given its problems with al-Assad regime, Turkey has had little inter­est to prevent flow of funds, arms and fighters to the insurgents in Syria. The US intervention in Iraq and the fall of Saddam changed the political equa­tion of the country. After years of suffering from discrimination and persecu­tion, now the Shias were the rulers in the new democratic Iraq. They consid­ered themselves entitled to it according to the principle of rule of majority, and were not ready to lose it at any cost. At the same time, de-Ba’athification and dissolution of the Iraqi army in practice meant deprivation of Sunnis from po­litical power, something that was unacceptable for the Sunni community. As proposed by Lars-Eric Cederman, Andreas Wimmer and Brian Min, ethnic groups are more likely to fight if they have lost power recently. Thus this was a motivating factor for Sunnis to join the insurgents and fight the Shia-domi­nated government and its foreign supporters. Another but perhaps more important factor for sectarian violence was a sectarian security dilemma which was created after the fall of Saddam. When an empire, state or central authority falls or becomes so weak that it cannot provide for order and security of its citizens, a security dilemma is created for ethnic or other identity groups. In such a situation, each group assumes re­sponsibility for its own security, and tries to provide for it by acquiring arms or establishing its own ethnic army to defend itself. In Iraq, not only was such a sectarian security dilemma created due to the fall of Saddam and the subse­quent dissolution of security institutions, but was also provoked and intensified by AQI. [by] targeting and hitting [Shia] in [their] religious, political, and military depth [to] provoke them to show the Sunnis their rabies and bare the teeth of the hidden rancor working in their breast. If we succeeded in dragging them into the arena of sectarian war, it will become possible to awaken the inattentive Sunnis as they feel imminent danger and annihilating death at the hands of these Sabeans. By 2006 Iraq was in the midst of a ruthless and violent sectarian conflict. The bombing of the Shia sacred Shrine of Samarra led to an unprecedented hike in sectarian violence where civilians of both Shia and Sunni communities were targeted by the death squads of the other side. Shia militias started moving into Sunni residential areas and killing hundreds in retaliation to the bombing of the shrine while the Sunni extremists targeted Shias by suicide bombings. Mass murders and abductions were the order of the day and bodies were thrown into the streets. The death toll reached to 34,000 in 2006. By the end of 2006, the Sunni community were pushed into a corner and believed that the only protector and savior against the brutal death in the hands of the Shia militias were the AQI and other Sunni extremist groups. As shown in the chart below, the total number of terrorist attacks exceeded 5,000 in November 2006. It was at the peak of sectarian violence that the “surge” and Sahwa (or the Awakening Movement of the Sunnis), were implemented. The strategic aim of both was to protect the population and address the underlying sectarian secu­rity dilemma. Now the Sons of Iraq, a coalition of Iraqi tribes armed and fi­nanced by the US military, provided security to the Sunni communities. No longer dependent on Al-Qaeda for security against the Shia militia, the Sunni tribes turned against it, leading to a significant reduction in violence and weak­ening of the insurgency. Figure 1: Enemy-initiated attacks against the coalition and its partners. However, once the US troops left and Awakening Movement was aban­doned by Iraqi government, the sectarian security dilemma intensified once again, pushing the Sunnis towards the IS. Abu Bakr al-Baghdadi used the same strategy of provoking a sectarian security dilemma by using the “sectarian-exis­tential grammar” of Zarqawi, while presenting itself as the protector and de­fender of the Sunnis in Iraq and Syria. The terrorist group continued to slaugh­ter Iraqi civilians as well as Iraqi security forces on a sectarian basis. In June 2014, IS executed 1,700 Shia soldiers after occupying Mosul. Similarly, af­ter capturing Tikrit, IS fighters divided the surrendered soldiers into two groups of Shias and Sunnis, and the Shias were all killed. These factors of course inten­sified sectarian conflicts with serious consequences for the region and the world. With the decrease of the US presence and influence in Iraq, the Maliki govern­ment became increasingly sectarian. The Awakening Movement was gradually put to an end and its leaders were harassed by the Shia dominant security forces. The situation in Diyala province was the most problematic. After the Prime Minister dispatched Iraqi Special Operations Forces to arrest the Presi­dent of Diyala University and a local council man, which resulted in the death of governor’s press secretary, the situation in the province went out of control. In Anbar province, Colonel Saad Abbas Mohammad, a commander of 3,000 Sons of Iraq, was the target of about 25 assassination attempts according to his own account. A program designed by the United States to transition about 30,000 Awakening Movement volunteers to state employment was not real­ized. Members of the Awakening Movement started to return to the insur­gency now led by a more ambitious leader, Abu Bakral-Baghdadi. According to Mullah Nadim Jibouri, in 2010 40 percent of AQI was composed of former Sons of Iraq who had defected due to fissures re-emerging between the government and Sunni tribes. Whilst one could ascertain that Maliki was playing the sectarian card in or­der to strengthen his support base among the Shia community for election purposes, the consequences for the country were destructive. In 2010 parlia­mentary elections Mr. Maliki won two seats less than his rival, Ayad Allawi’s block. Nevertheless he managed to form the government with Iranian support and intervention. Henceforth, he became even more sectarian. In December 2011, he ordered the arrest of two of the most senior Sunni leaders, Rafi Al-Is­sawi, the Finance Minister, and Tariq al-Hashimi, the Vice President of Iraq on charges of terrorism. Mr. Hashimi fled to Kurdistan and was sentenced to death in absentia. These and other sectarian policies by Maliki led to demonstrations in Sunni-dominated areas of Iraq. On April 2013, the Iraqi Army stormed a peace camp at Hawijah, west of Kirkuk, killing more than fifty peaceful Sunnis. This incident and other underlying grievances turned the protests into an insur­gency and widespread violence throughout Iraq, leading to al-Qaeda style at­tacks on Shia sites as well as attacks on Sunni mosques. While Mr. Maliki’s fear-mongering sectarian political campaign which was built around a Sunni counter-revolution helped him to succeed in 2014 elec­tions, it helped Baghdadi too. A little more than a year following the start of widespread Sunni protest, during which Maliki refused to give any concessions, IS was at the outskirts of Baghdad. By June 2014, with the help of local Sunnis, IS had captured Sunni dominated provinces of Nineveh, Salahuddin and parts of Diyala, and proclaimed its Caliphate. This research paper examined the extent to which both the US intervention in Iraq in 2003 and sectarian conflict in the country and the region contributed to the rise and consolidation of IS. Based on the above analysis, both the US inter­vention in 2003 and ethnic conflict in Iraq and the region did contribute to the rise and consolidation of IS. While the US intervention contributed to the rise, popularity and strengthening of the insurgency, sectarian conflict contributed to the consolidation and sustainment of the group. It was argued that the US intervention in Iraq and its aftermath contributed to the rise and consolidation of IS in the following ways: First, it created a stra­tegic cause for mobilization and popularity of the insurgency that eventually evolved to IS. Second, weakness of the counterinsurgents, deemed as a pre-requisite of a successful insurgency, allowed a strengthening of the insurgency. Political weakness of counterinsurgents included the weak legitimacy, the lack of a post-intervention plan and poor policy decisions such as de-Ba’athification and disbanding of the Iraqi army. Military weakness referred to the challenges of insufficient troops and the lack of a COIN doctrine in the initial phase of the intervention. While the US military adapted its strategy and extra troops were deployed, which succeeded in reducing violence and weakening the insurgency, the lack of a long-term commitment from the US, unwelcoming attitude of Iraqi gov­ernment and premature withdrawal of US troops led to a revival of the insur­gency. Finally, administrative weakness, including inability to provide services to the people, limited government’s ability to win over the population. Further it was argued that the US-run detention facilities served as Jihadi universities for indoctrination of fighters and networking among senior AQI leaders who, later on, assumed leadership responsibilities in the Islamic State. Sectarian conflict in Iraq and the region, it was argued, contributed to the rise and consolidation of IS in the following ways. First, a sectarian security di­lemma in the region following the Islamic revolution of Iran prompted Saudi Arabia’s decision to fund the proliferation of Salafism/Wahhabism – an ideol­ogy that inspires extremist groups and provides the intellectual foundations for IS. Secondly, the overthrow of Saddam further intensified the sectarian security dilemma and funding from Saudi Arabia and its allies to Sunni insurgent groups to balance the shift of power to Shias in the region. The resultant continuation of conflict in Syria enabled IS to capture large swaths of territory and declare al-Raqqa its capital. Finally, sectarian policies of Prime Minister Maliki and exclu­sion of Iraqi Sunni communities from power led to their support for IS, en­hancing its capabilities to capture Sunni-dominated provinces in Iraq and even­tually proclaim its Caliphate. There are a number of lessons learned and policy implications that may be drawn from this analysis. The Islamic State is a very sophisticated political, mili­tary and ideological terrorist group that has used the sectarian conflict and ex­ternal intervention to mobilize fighters and justify its atrocities. To defeat this group, the right political solution, a strong will and long-term commitment will be required. Firstly, a political solution which could address the security di­lemma as well as the political, economic and religious rights of Sunni communi­ties in Iraq and Syria is a precondition for the defeat of the terrorist group. Sec­ondly, a population-centric counterinsurgency strategy which could clear the territories of IS and keep the terrorists out by protecting the population and providing them security will be required over a long period of time to succeed. Thirdly, a regional agreement which addresses the security concerns of the main regional players such as Iran, Saudi Arabia and Turkey is needed for long-term security and stability in the region. Another lesson learned is that external intervention creates a strategic cause for mobilization and may strengthen insurgencies. COIN campaigns re­quire long-term commitment and considerable resources, which is oftentimes difficult to make or put in place. Therefore, it is better not to intervene in the first place where possible. However, wherever inevitable, the intervention should be well-planned and well-resourced with a legitimacy and long-term commitment to convince the people and insurgents that the government will eventually win. As the “surge” and some other cases of intervention such as Northern Ireland, Malaya and NATO intervention in Bosnia showed, a well-planned and resourced counterinsurgency campaign with long-term commit­ment could in fact succeed in stabilizing the situation and defeating the insur­gency. Abdul Basir Yosufi is the General Director for International Cooperation at Af­ghanistan Ministry of Interior, where he has previously worked as a Senior Pol­icy Advisor and Policy Analyst since 2010. Before joining the government, he worked in private and non-governmental organizations. He received his Master of Advance Studies (MAS) in European and International Security from GCSP and University of Geneva in 2016 as well as a Master of Science in Foreign Ser­vice from Georgetown University School of Foreign Service in 2010. He com­pleted his Bachelor of Arts in Political Science from Delhi University in 2006. He has received several scholarships and awards including Fulbright scholarship, Georgetown SFS Dean’s Award for Academic Excellence and GCSP/University of Geneva MAS award for the Most Outstanding Research Paper. He speaks Per­sian, Pashto, English, Urdu, Hindi and some Arabic. His research interests are Security issues in South Asia, Counter-terrorism Counter-insurgency and Secu­rity Sector Reform. Mohammad-Mahmoud Ould Mohamedou, “ISIS and the Deceptive Rebooting of al Qaeda,” GCSP Policy Paper 2014/5 (Geneva: GCSP, August 2014), accessed August 3, 2016, http://reliefweb.int/sites/reliefweb.int/files/resources/ISIS%20and%20the%20Deceptive%20Rebooting%20of%20Al%20Qaeda.pdf, 2. David Galula, Counterinsurgency Warfare: Theory and Practice (Westport, Conn.: Greenwood Publishing Group, 2006), 17. Patrick Cockburn, The Rise of Islamic State: ISIS and the New Sunni Revolution (New York: Verso Books, 2015), 28. Galula, Counterinsurgency Warfare: Theory and Practice, 17. George W. Bush, Radio Address, March 22, 2003, White House Archives, accessed March 20, 2016, http://georgewbush-whitehouse.archives.gov/news/releases/2003/03/20030322.html. Anthony H. Cordesman, “Iraq: Too uncertain to call” (Centre for Strategic and Interna­tional Studies, 2003), 2. Sean Loughlin, “Rumsfeld on looting in Iraq: ‘Stuff happens,’” CNN, April 12, 2003, accessed March 20, 2016, http://edition.cnn.com/2003/US/04/11/sprj.irq.pentagon. Bruce Hoffman, “Insurgency and Counterinsurgency in Iraq,” Studies in Conflict & Ter­rorism 29, no. 2 (2006): 103–121, quote on pages 2–3. Paul L. Bremer, “Coalition Provisional Authority Order Number 1: De-Ba’athification of Iraqi Society” (Coalition Provisional Authority, 2003), accessed March 1, 2016. Bruce R. Pirnie and Edward O’Connell, Counterinsurgency in Iraq (2003–2006), Vol­ume 2 (Santa Monica, CA: Rand Corporation, 2008), 26. Michael Weiss and Hassan Hassan, ISIS: Inside the Army of Terror (New York: Simon & Schuster, 2015), 120–21. W. Andrew Terrill, Lessons of the Iraqi De-Ba'athification Program for Iraq’s Future and the Arab Revolutions (Carlisle, PA: U.S. Army War College, Strategic Studies Insti­tute, May 2012), accessed April 12, 2016,http://www.dtic.mil/dtic/tr/fulltext/u2/a560673.pdf, p. x.
 Brian Burton and John Nagl, “Learning as we go: the US army adapts to counterinsur­gency in Iraq, July 2004–December 2006,” Small Wars & Insurgencies 19, no. 3 (Sep­tember 2008): 303–27. John A. Nagl, et al., The US Army/Marine Corps Counterinsurgency Field Manual (Uni­versity of Chicago Press, 2008), 23. James T. Quinlivan, “Burden of Victory: The Painful Arithmetic of Stability Opera­tions,” Rand Review 27, no. 2 (2003): 28–29. David Kilcullen, “Don’t Confuse the ‘Surge’ with the Strategy,” Small Wars Journal (Jan­uary 2007), accessed March 5, 2016, http://smallwarsjournal.com/blog/dont-confuse-the-surge-with-the-strategy. Kimberly Kagan, Iraq Report (Washington, D.C.: The Institute for the Study of War, 2007). Raymond T. Odierno, “The Surge in Iraq: One Year Later,” Lecture #1068 on National Security and Defense (Heritage Foundation, 13 March 2008), accessed March 12, 2016, http://www.heritage.org/research/lecture/the-surge-in-iraq-one-year-later. Andrew Terrill, Lessons of the Iraqi De-Ba'athification Program for Iraq’s Future and the Arab Revolutions, 24. Weiss and Hassan, ISIS: Inside the Army of Terror, 83. Terrence McCoy, “Camp Bucca: The US prison that became the birthplace of Isis,” Inde­pendent, November 4, 2014, accessed April 12, 2016, www.independent.co.uk/news/world/middle-east/camp-bucca-the-us-prison-that-became-the-birthplace-of-isis-9838905.html. Richard Barrett, The Islamic State, The Soufan Group Report, November 2014, ac­cessed April 5, 2016, http://soufangroup.com/wp-content/uploads/2014/10/TSG-The-Islamic-State-Nov14.pdf. Cockburn, The Rise of Islamic State: ISIS and the New Sunni revolution, 88. Vali Nasr, The Shia Revival: How Conflicts within Islam Will Shape the Future (New York: W.W. Norton & Company, 2007). Amir M. Haji-Yousefi, “Whose Agenda Is Served by the Idea of a Shia Crescent?” Alternatives: Turkish Journal of International Relations 8, no. 1 (Spring 2009): 114–35. Nasr, The Shia Revival: How Conflicts within Islam Will Shape the Future. Bouthaina Shaaban, “The Rise of ISIS and Other Extremist Groups: the role of the West and Regional Powers” The Canadian Charger, February 19, 2016, accessed April 12, 2016, http://www.thecanadiancharger.com/page.php?id=5&a=1967. Sami Moubayed, Under the Black Flag: At the Frontier of the New Jihad (I.B. Tauris, November 2015), 11. Thom Workman, “The Social Origins of the Iran-Iraq War,” CISS Working Paper #5 (Downsview, Ontario: York University, Centre for International and Strategic Studies, 1991). Moubayed, Under the Black Flag: At the Frontier of the New Jihad, 11–12. Lars-Erik Cederman, Andreas Wimmer, and Brian Min, “Why Do Ethnic Groups Re­bel? New Data and Analysis,” World Politics 62, no. 1 (January 2010): 87–119. Michael E. Brown, ed., Ethnic Conflict and International Security (Princeton University Press, 1993), 103–10. Cockburn, The Rise of Islamic State: ISIS and the New Sunni Revolution, 29. David Kilcullen, The Accidental Guerrilla: Fighting Small Wars in the Midst of a Big One (New York: Oxford University Press, 2009), 127. Michael E. O’Hanlon and Jason H. Campbell, Iraq Index – Tracking Variables of Recon­struction & Security in Post-Saddam Iraq, Brookings Institution Report (December 2008), accessed March 29, 2016, https://www.brookings.edu/wp-content/uploads/2016/07/index20081218.pdf. Weiss and Hassan, ISIS: Inside the Army of Terror, 29. Weiss and Hassan, ISIS: Inside the Army of Terror, 90. Cockburn, The Rise of Islamic State: ISIS and the New Sunni Revolution, 48. David, Galula. Counterinsurgency Warfare: Theory and Practice. Westport, CT: Praeger Security International, Classics of the Counterinsurgency Era, 2006. Cockburn, Patrick. The Rise of Islamic State: ISIS and the New Sunni Revolution. New York: Verso Books, 2015. Bush, George W.. Radio Address In White House Archives., 2003. Cordesman, Anthony H.. Iraq: Too uncertain to call. Centre for Strategic and International Studies, 2003. Loughlin, Sean. Rumsfeld on looting in Iraq: ‘Stuff happens’. CNN, 2003. Bremer, Paul L.. Coalition Provisional Authority Order Number 1: De-Ba’athification of Iraqi Society. Coalition Provisional Authority, 2003. Bremer, Paul L.. Coalition Provisional Authority Order Number 2: Dissolution of Entities. Baghdad, 2003. Sly, Liz. "The hidden hand behind the Islamic State militants? Saddam Hussein’s." Washington Post (2015). Mastracci, Davide. How the catastrophic American decision to disband Saddam’s military helped fuel the rise of ISIL. National Post, 2015. W. Terrill, Andrew. Lessons of the Iraqi De-Ba'athification Program for Iraq’s Future and the Arab Revolutions. Carlisle, PA: U.S. Army War College, Strategic Studies Institute, 2012. Burton, Brian, and John Nagl. "Learning as we go: the US army adapts to counterinsurgency in Iraq, July 2004–December 2006." Small Wars & Insurgencies 19, no. 3 (2008): 303-27. Kilcullen, David. "Don’t Confuse the ‘Surge’ with the Strategy." Small Wars Journal (2007). Kagan, Kimberly. Iraq Report. Washington, D.C.: The Institute for the Study of War, 2007. Odierno, Raymond T.. The Surge in Iraq: One Year Later In Lecture #1068 on National Security and Defense. Heritage Foundation, 2008. McCoy, Terrence. "Camp Bucca: The US prison that became the birthplace of Isis." Independent (2014). Na, sr, Vali. The Shia Revival: How Conflicts within Islam Will Shape the Future. New York: W.W.: Norton & Company, 2007. Haji-Yousefi, Amir M.. "Whose Agenda Is Served by the Idea of a Shia Crescent?" Alternatives: Turkish Journal of International Relations 8, no. 1 (2009): 114-35. Shaaban, Bouthaina. The Rise of ISIS and Other Extremist Groups: the role of the West and Regional Powers. The Canadian Charger, 2016. Moubayed, Sami. Under the Black Flag: At the Frontier of the New Jihad. I.B. Tauris, 2015. Cederman, Lars-Erik, Andreas Wimmer, and Brian Min. "Why Do Ethnic Groups Rebel? New Data and Analysis." World Politics 62, no. 1 (2010): 87-119. Brown, Michael E.. Ethnic Conflict and International Security. Princeton University Press, 1993. Kilcullen, David. The Accidental Guerrilla: Fighting Small Wars in the Midst of a Big One. New York:: Oxford University Press, 2009. O’Hanlon, Michael E., and Jason H. Campbell. Iraq Index – Tracking Variables of Reconstruction & Security in Post-Saddam Iraq In Brookings Institution Report., 2008. Tomlinson, Simon, and Amy White. Mail Online., 2014. APA style: Yosufi, A. Basir (2016). The Rise and Consolidation of Islamic State: External Intervention and Sectarian Conflict. Connections: The Quarterly Journal. 15(4), 91-110. Chicago style: Yosufi, Abdul Basir. "The Rise and Consolidation of Islamic State: External Intervention and Sectarian Conflict." Connections: The Quarterly Journal 15, no. 4 (2016): 91-110. IEEE style: Yosufi, A. Basir, "The Rise and Consolidation of Islamic State: External Intervention and Sectarian Conflict", Connections: The Quarterly Journal, vol. 15, issue 4, pp. 91-110, Fall 2016.